With the Divine Blessings of Bhagwan Sri Sathya Sai Baba, Radio Sai went on the air for the first time on 23rd November 2001. 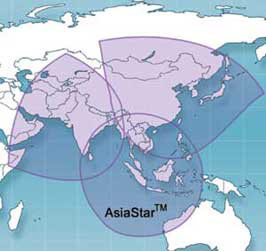 Initially the broadcast service was restricted to just parts of Asia. Currently we cover the whole globe, and our services are available 24 hours a day, 7 days a week. 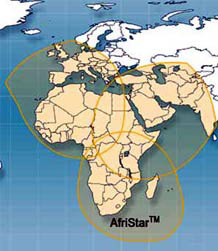 In Asia, our services can be picked up on the AsiaStar satellite of WorldSpace, while we serve Africa and Europe via the AfriStar satellite of WorldSpace. The footprints of these two satellites are shown below. From end of January 2010, SGH services on AfriStar are suspended, so this region is also covered with our web streaming service. Besides the two satellite radio services, we also offer a streaming service on the internet, especially for the benefit of listeners in America, Scandinavia, Eastern Europe, Russia, Australia and New Zealand.